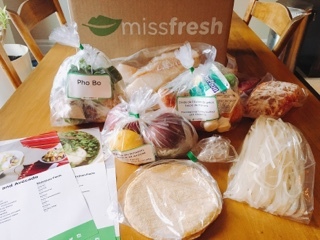 As the last meal kit delivery company I would be cooking with, the three meals from Miss Fresh was a bittersweet ending. It’s been a blast making use of the kitchen again and sitting down to a home cooked meal with my husband throughout the week. Yet, it’s also a relief that the pressure to return home, at a decent time, to prepare dinner is over (at least for now)! For my schedule, the Tuesday delivery date makes the service inconvenient. The later arrival meant I still had to purchase groceries for Monday, an evening that most households typically stay in, and had to leave my Tuesday to Thursday evenings free to actually use all the meals. Miss Fresh’s kits arrived in a sturdy cardboard box with built in reflective packaging on the inside. The use of two massive ice packs that were almost the width of the box was smart as the protective layers ensured all the proteins were very cold even though I didn’t put them into the fridge until well after work. Additionally, the well labeled, separate packing for each meal ensured there was no confusion as to what ingredients accompany each recipe. Most companies suggest you cook meals containing fish first, since the protein tends to spoil the quickest. Given we selected fish tacos from Miss Fresh, I wanted to follow protocol and prepare this on Tuesday. In reality, it had to wait until the last evening (although the fish was still fine after three days) as the mango and avocado used in the recipe was hard and unripen. After a few days in a paper bag, the avocado was finally soft enough and the mango still hard but sweet. Something for Miss Fresh to consider: if a meal needs to be prepared on a timely basis, it’s important to ensure all the accompanying ingredients are also ready for use. 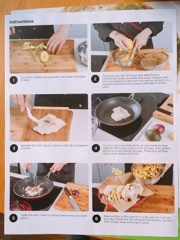 The recipe cards were easy to follow with a limited number of steps and coloured photos that help provide clarity for the description. Since the recipes are made for 2, 4 and 6-person meals, you will need to flip to the front to figure out measurements required for items that don’t arrive with the meal kit (mainly water). 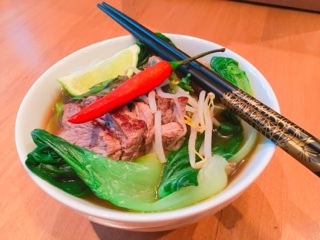 For example, the beef pho stated to combine everything with the dissolved beef broth – it took me a while to realize where to find the water measurements to prepare the broth. Overall, the cooking times for the protein were off; therefore, to ensure food safety, I’d suggest Miss Fresh include recommended internal temperature times in some recipes. Something like the stuffed turkey breast could have benefited from this detail. The recipe noted the portion for two would take 25 minutes, this seemed very quick, so I was already skeptical, but determined to follow everything as intended. Sure enough, even after letting it rest for a few minutes, upon slicing into the turkey the meat stuffing was raw and required another twenty minutes in the oven (since it was already sliced it made the turkey itself dry). On the other hand, the cooking time for the thin tilapia slices for the tacos was too long. After seeing that the fish was indeed “flaking easily”, I removed them from the pan or the tilapia would have become a rubbery mess. Although recipes could be made without any fancy gadgets, some of them, like the beef pho, requires A LOT of pots and pans – a frying pan for the beef, one pot to prepare the noodles, and two pots (or one pot and large bowl) for the soup (after boiling the broth you need to strain it before you continue cooking with other ingredients). The amount of equipment, is likely doable in most households, but sure adds to the amount of dishes that has to be washed later. The beef broth for the pho smelled amazing – how the main floor of the house filled with a lovely star anise and beef smell. Actually tucking into the bowl of afterwards was disappointing. Firstly, the dish definitely requires salt even though the recipe didn’t call for it; the broth was somewhat flavourful but without salt lacked interest. Secondly, the cooking time for the noodles should be more than three minutes (maybe another minute or two) as the noodles were still hard so didn’t have the slippery chewy texture you expect with pho. Finally, the beef really needed to the thinly sliced version (generally found in Asian supermarket) rather than a hunk of flank steak that you pan fry and prepare yourself. No home cook can ever slice the beef thinly enough and the pho ends up being finished with a chewy protein. 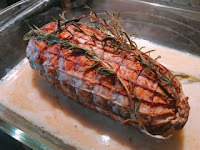 A great meal to ring in the Thanksgiving weekend early was the turkey breast. The recipe describes the stuffing as “chestnut stuffing” but it ended up incorporating so much more - minced pork, wild rice, poultry liver & red currant jelly! 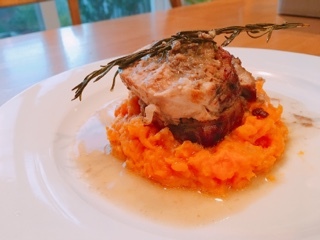 The result was a richly flavoured dish. If I hadn’t sliced the turkey and put it back into the oven, likely a really moist protein as well. Luckily, there was enough of the cooking liquid remaining that spooning that onto the turkey helped to rehydrate the fowl. Our last meal, the long awaited fish tacos, was a nice light way to end. 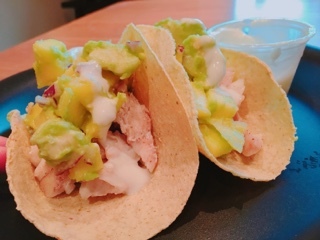 Although the tilapia was left relatively plain (just a dash of five spice), the mango and avocado salsa on top was strong enough for interest. In hindsight, I should have spread the plain yoghurt onto the corn tortillas, rather than drizzling on top, as after a few days the corn tortillas were somewhat dry. Despite being a tasty meal, I couldn’t help but feel there was something missing with the dish. The two fish tacos a good start but not enough to satisfy – perhaps tortilla chips or a salad would have helped to make it a more satisfying meal. Overall, Miss Fresh’s portions are smaller than competitors. So, if you’re trying to squeeze a lunch from leftovers you’ll likely be disappointed. On a positive note, the well sized portions does help to ensure you don’t over eat, so this is perfect for individuals who can’t resist finishing everything on their plate. The cheapest is $7.75 (for a custom box with five meals for six people) while the most expensive is $9.79 (for a vegetarian meal kit with two meals for four people). Miss Fresh is by far the most cost effective and personalizable of all the delivery services. If the above has intrigued you, sign up and try a week for yourself. 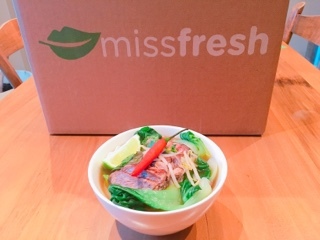 Miss Fresh is offering Gastro World readers $30 off their first order. Just use the code GASTROWORLD30 on their website - https://www.missfresh.com/.